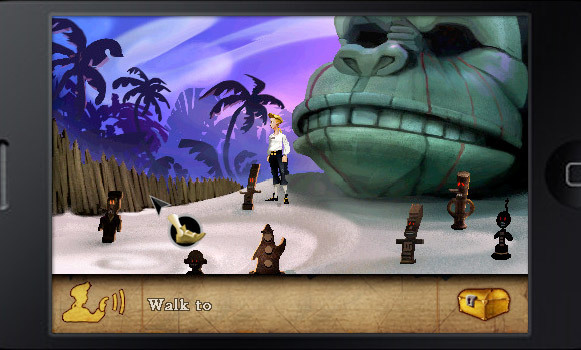 Following the recent rumours of a port, Lucasarts quietly slipped The Secret of Monkey Island onto the iTunes App Store this week without fanfare… So quietly that it still isn’t mentioned on the game’s official site. But yes, that’s right, you can now play the updated point and click classic on your iPhone and iPod Touch! Weighing in at a hefty (for an iPhone app, anyway) 350Mb, it includes the new “special edition” version with the voices and enhanced soundtrack found on the Xbox and Windows versions as well as the original VGA version, just as it appeared in 1990. Simply swipe two fingers across the screen at any time while playing to switch between them. Swiping two fingers sure is easier than messing with DOS extended memory and Soundblaster drivers for hours on end! Oh how I miss 1990s PC gaming… You really had to work to play a game back then. None of this plug and play nonsense. The new high-definition visuals work just as well on the less than high definition format of the iPhone’s three and a half inch screen. The controls, while seemingly cumbersome at first, work incredibly well once you realise that the screen is functioning in the same way as a laptop trackpad to guide the cursor around. This offers much more precision than if you were to use a greasy finger stump to directly select objects on the screen. Just as in the original it’s possible to store multiple saved games which means you can let your friends and family have a go. It’s a simple feature that’s surprisingly lacking in many iPhone games that would benefit well from it. Yes, I’m looking at you, Rolando! In summary, it’s a great port of a lovely revisiting of a fantastic classic. Buy it now and help ensure Lucasarts re-release Sam & Max Hit the Road, Day of the Tentacle and the rest of their point and click adventure back catalogue! If you follow our Twitter stream you would have caught a sneaky glimpse of the new Alice in Wonderland teaser trailer the other day. It somehow managed to slip out onto the net before Disney meant it to and was quickly pulled. For the patient (and for those that appreciate a nice big picture!) it is now available, following its unveiling at the San Deigo Comic-Con, in full HD at the Apple Trailers site. 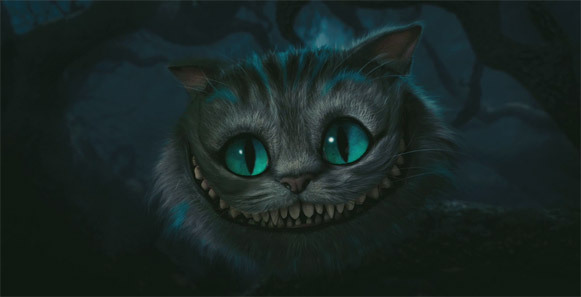 Alice in Wonderland, directed by Tim Burton, will feature elements from both of Lewis Carroll’s Alice books, Alice’s Adventures in Wonderland and Through the Looking Glass and is scheduled for release on March 10th, 2010. Remember that blurry footage of the Tron sequel trailer from last year’s Comic-Con? Well, they showed it again this year — this time in 3D! Technically it’s “test footage” and since then the movie has been given a name: Tron Legacy. The visuals are stunning enough to overshadow the fact it sounds a bit like a men’s aftershave. Those visuals? No more squinting necessary! They’re up in various flavours on the viral site flynnlives.com — including full HD Quicktime. 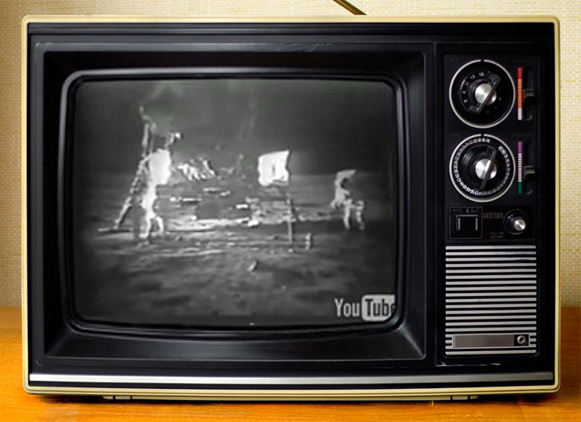 To celebrate the 40th anniversary of the first landing on the moon, Jason Kottke has set up a virtual 1960s television set which will broadcast coverage “live” tonight at 16:00 EDT for the moon landing and 22:10 EDT for the moon walk. The coverage will be reported by the late Walter Cronkite, who sadly passed away last Friday. The Apollo 11′s lunar module, the LM-5 (better known as the Eagle), landed on the moon, with Buzz Aldrin and Neil Armstrong as its passengers, on July 20th 1967. A game that simply couldn’t exist on any other platform, Eliss is wonderful in its deceptive simplicity in much the same way Tetris was (and is). Split circles — planets — apart with your fingers to form smaller planets and slide them together to form larger ones in an attempt to adjust them to just the right size to slot them into a squeesar to cause a supernova. When different colour planets collide your health goes down, to recoup health grab the little stardust triangles. And that’s it! Easy… right?